Happy, successful people have one thing in common: they know how to harness the power of positive thinking. Developing a positive attitude can help transform many areas of your life in ways that might surprise you. 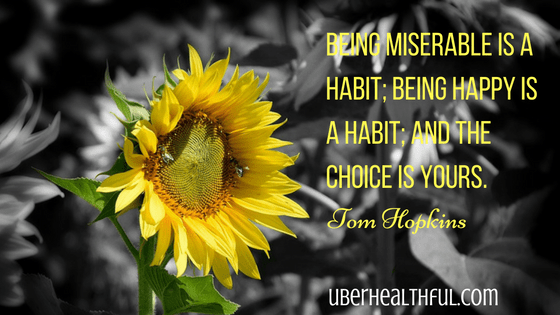 It really all comes down to the habits that we choose to create in our lives on a daily basis. When you are in control of your life and think about things that make you happy, you will experience a feeling of well-being. When you are not in control of your life and constant negative thoughts overwhelm your mind, you will usually feel lethargic, unmotivated to move forward and just plain ‘ole sick! When you truly harness the power of positive thinking, you can experience decreased stress levels and an better quality health. Seeing the positive side of life will also give you the inner strength and resilience to get through the difficult times that we all experience. 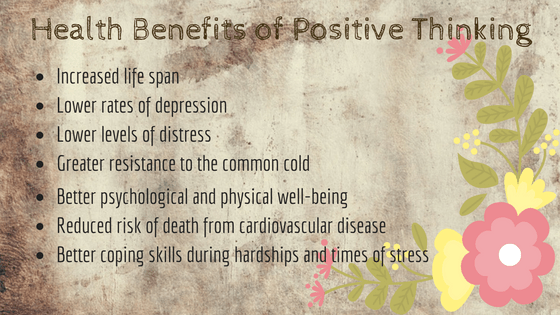 What are the Health Benefits of Positive Thinking? Many years ago I was in a very stressful life situation and didn’t have the knowledge or tools to stand up to my own negativity. As a result I was sick all the time with colds, felt exhausted on a constant basis, had headaches, and was somewhat depressed. That was not a healthy situation for me or my family so I had to find a way to get stronger in all areas of life. It all started with the power of power thinking. My entire life turned around. I never get sick anymore and have experienced incredible success both personally and professionally. No one wants to be around a negative Nellie! Ready to make a change? By choose a positive attitude, you can. Remember, that change doesn’t happen overnight. Time will pass anyway so why not spend it focusing on being the very best version of you? So many people focus on what they don’t have in their lives. Then they fill their mind with wishful thoughts that often turn to negative resentment. Instead, give thanks for the things you do have. What is good in your life? It can be the smallest thing that makes you happy. Starting each day with a grateful heart can help energize you as you move through your day. Each morning, write down 3 things that you are grateful for. Focus on the positive things that they bring to your life. It can be simple. Sometimes I wake early and am gifted with a magnificent sunset. In that moment, I am grateful for having seen such beauty that nature offers us. The best thing is to find joy in your journey, whatever it may be! You are what you eat. Most foods these days are processed and have little to no “read” food ingredients at all. When you transition to a healthier lifestyle, your body will feel better and more energized, which leads to being more excited and positive about life! With just a few simple changes, anyone can do this. I used to eat mostly processed food and felt like crap all the time. I was simply too tired to do anything. Sometimes I felt like I had brain fog. Now that I am fully into a healthy lifestyle, I have more energy than people half my age and I feel amazing most of the time. When people complain all the time, they are not fun to be around. Complaining on a constant basis means you are likely having mostly negative thoughts, seeing the downside of everything and constantly whining. Have you heard of Doug and Wendy Whiner? Think before speaking when you feel a complaint coming on and consider how you turn it into a positive message. Visualization is one of the most powerful ways to create success in your life. What is it that you wish to achieve in your life? Visualize it each day as well as the steps to get there. No matter how far fetched it seems now, when you visualize achieving your goals, they will become more real and attainable for you. That leads to feelings of happiness and can turn your attitude around. Guess what happens if you surround yourself with negative nellies all day? You become just like them. One fantastic way to harness the power of positive thinking is to surround yourself with others who think that way too. Being around people who lift you up and are positive and enthusiastic about life will give you a whole new outlook! Focusing on positive habits and thoughts can turn your life around. From learning to be grateful to transitioning to a healthy lifestyle, these will contribute to a more positive, healthful lifestyle. Thank you for taking the time to read this article about harnessing the power of positive thinking. I hope you gained some insights here to help improve your life in some way.